Manufacture: Motorcraft. 1983-1984 FORD BRONCO V8-5.0L / 5.8L. 1983-1983 FORD E-100 ECONOLINE V8-5.0L / 5.8L. 1983-1983 FORD E-100 ECONOLINE CLUB WAGON V8-5.0L / 5.8L. 1983-1984 FORD E-150 ECONOLINE V8-5.0L / 5.8L. FORD VAN E250 78 8-460, ID D8TE-AKA. FORD PICKUP F350 SERIES 78 8-460, ID D8TE-AKA. FORD VAN E350 78 8-460, ID D8TE-AKA. Model: FORD PICKUP F250. FORD PICKUP F250 SERIES 78 8-460, ID D8TE-AKA. FORD PICKUP F150 SERIES 78 8-460, ID D8TE-AKA. 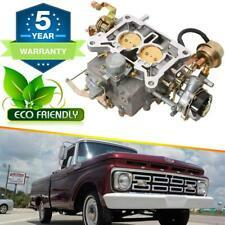 For Ford F100 1964~1978 Engine 289 Cu, 302 Cu, 351 Cu. Introduction: A carburetor is a device to mix air and fuel for internal combustion engines in the proper ratio for combustion. The fuel and air mixture is too rich if it has an excess of fuel, while too lean if there is not enough. Broncos, Fairmont,Granada,, F100, F150, F250 & F350. Carburetor For 1965-85 Ford Engines YFA 1barrel Electric Choke 4.9/3.3L 300cu I6. Type: automatic choke. 4.9 L 300 cu. 4.1 L 250 cu. 3.3 L 200 cu. 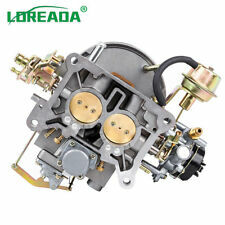 1x Car Carburetor for Ford. EVERTHING IS FREE MOVING, AND LOOKS GREAT. Broncos, Fairmont,Granada,, F100, F150, F250 & F350. 4.9 L 300 cu. 4.1 L 250 cu. 3.3 L 200 cu. 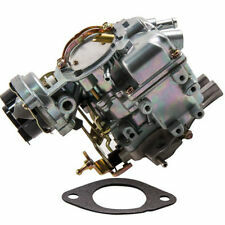 Carburetor For 1965-85 Ford Engines YFA 1barrel Electric Choke 4.9/3.3L 300cu I6. 1x Car Carburetor for Ford. Swapped it out for a different carb. Needs a little cleaning to remove the gas stains but thats about it. Clean-up, install and ready to go. Original thermostat housing for Ford 360 C. I. engine. This is a 2 barrel Motorcraft 2150 carburetor with an automatic choke. From core to finished product, this carburetor was rebuilt to factory pre-set internal and external settings. Ford F-100 1977 5.8. Carburetor For 1965-85 Ford Engines YFA 1barrel Electric Choke 4.9/3.3L 300cu I6. Broncos, Fairmont,Granada,, F100, F150, F250 & F350. 1x Car Carburetor for Ford. for Ford Engines 4.1 L 250 cu. When will my order be dispatched?. 1StopAutoPartZ WeekEND 10% OFF United Remanufacturing! AUTOLITE 2150 CARBURETOR W/ CLIMATIC CHOKE 1977-79 FORD BRONCO and F-SERIES TRUCK's w/302 V8 #5719. Fits: 1977-79 FORD BRONCO and F-Series Trucks w/302c. i. V8 engines that use Autolite 2150 2bbl's with Climatic-Choke. Part Number: 2100,A800. Ford F350 1964~1979 Engine 289 Cu, 302 Cu, 351 Cu. Ford F150 1964~1978 Engine 289 Cu, 302 Cu, 351 Cu. Ford F250 1964~1978 Engine 289 Cu, 302 Cu, 351 Cu. Ford Mustang 1968~1973 Engine 289 Cu, 302 Cu, 351 Cu. Ford F350 1964~1979 Engine 289 Cu, 302 Cu, 351 Cu. Ford F250 1964~1978 Engine 289 Cu, 302 Cu, 351 Cu. Ford F150 1964~1978 Engine 289 Cu, 302 Cu, 351 Cu. Compatibility chart is for reference only. Jeep Wagoneer 1964~1978 Engine 360 Cu. Engine: 4.9L 300Cu L6. -Model: F150. -Year: 1975 - 1985. -Make: Ford. Coolant Hose Connector. New Arrival Radiator. Windshield Wiper Blades. Hot Sale Radiator. BRONCOS, FAIRMONT, GRANADA, ECONOLINE E SERIES, F100, F150, F250 & F350. Compatibility chart is for reference only. 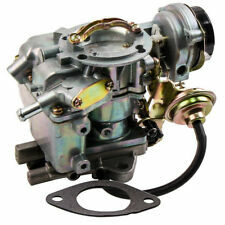 1x Car Carburetor for Ford. 1965 TO 1985. FORD ENGINES Directly replace the old/broken one. FORD E&F 150-350 300CYL 1 BBL CARB. SOLD AS REBUILDABLE CORE OR PARTS. ALL THERE. THROTTLE PLATE AND CHOKE ARE FREE. AS IS. UNLESS OTHERWISE STATED. HAD FRESH GAS IN IT. ALL PARTS SEEM TO BE THERE. EVERYTHING MOVES FREELY AND SPRINGS BACK. Ford F150 1964~1978 Engine 289 Cu, 302 Cu, 351 Cu. Part Number: 2100,A800. Compatibility chart is for reference only. Ford F250 1964~1978 Engine 289 Cu, 302 Cu, 351 Cu. Jeep Wagoneer 1964~1978 Engine 360 Cu. YOU ARE LOOKING AT A REMANUFACTURED TO ORIGINAL "READY TO RUN" AUTOLITE 2150 2BBL CARBURETOR FROM VAPEX, A LEADER IN PRECISION REMAN CARBURETORS. 1977-1979 FORD AUTOLITE 2150 CARBURETOR fits TRUCK 's w/351-400ci V8 # 180-6257. 4.9 L 300 cu. 4.1 L 250 cu. 3.3 L 200 cu. BRONCOS, FAIRMONT, GRANADA, ECONOLINE E SERIES, F100, F150, F250 & F350. Compatibility chart is for reference only. 1965 TO 1985. 1x Car Carburetor for Ford. US STOCK!Warranty Guaranteed,2-6 Days Ship time!Best! BRONCOS, FAIRMONT, GRANADA, ECONOLINE E SERIES, F100, F150, F250 & F350. 4.9 L 300 cu. 4.1 L 250 cu. 3.3 L 200 cu. Compatibility chart is for reference only. 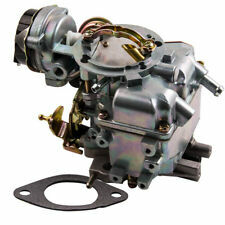 1x Car Carburetor for Ford. FORD ENGINES. 1985 Ford F150 5.8L V8 VIN: H. 1986 Ford F150 5.8L V8. 1975 Ford F150 6.4L V8 VIN: M. 1976 Ford F150 6.4L V8 VIN: M. 1984 Ford F150 5.8L V8 VIN: H. 1987 Ford F150 5.8L V8. Secondary w / Velocity Air Valve. 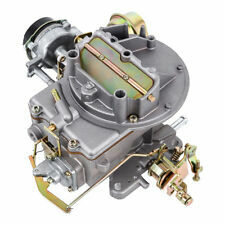 Secondly, the carburetor has the unique ability to hold a tune, so once it is tuned, the carburetor stay's tuned. The lightweight all-aluminum body features a two-piece body that resists warping and is compatible with gasohol and blended fuels. BRONCO 79 8-351M, AT. FTF100 79 8-351M, ID D9PE-HA. 8-351M, ID D9TE-ALB. 8-351M, ID D9TE-AMB. 8-351M, ID D9TE-BPB. 8-351M, ID D9TE-DFB. FTF150 79 8-351M, ID D9PE-HA. 8-400, ID D9PE-HA. Ford F350 1964~1979 Engine 289 Cu, 302 Cu, 351 Cu. Ford F150 1964~1978 Engine 289 Cu, 302 Cu, 351 Cu. Ford Mustang 1968~1973 Engine 289 Cu, 302 Cu, 351 Cu. Ford F250 1964~1978 Engine 289 Cu, 302 Cu, 351 Cu. Ford F150 1964~1978 Engine 289 Cu, 302 Cu, 351 Cu. Compatibility chart is for reference only. 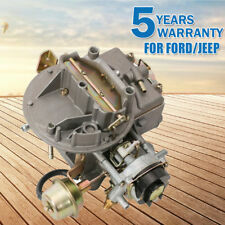 1x car carburetor for Ford. Ford F350 1964~1979 Engine 289 Cu, 302 Cu, 351 Cu. Ford Mustang 1968~1973 Engine 289 Cu, 302 Cu, 351 Cu. 1984-1977 Ford F-350 (5.8L 351Cu. V8 GAS OHV Naturally Aspirated). 1979-1977 Ford F-100 (5.8L 351Cu. 1980-1975 Ford F-350 (5.0L 302Cu. 1979-1975 Ford F-100 (5.0L 302Cu. 1974 Ford F-350 Pickup (5.0L 302Cu. ). Carburetor 162 (1). Not sure if the part fits your vehicle?. Parts include Free 12 month warranty. These chassis parts are known globally to be of the best quality and at a price that is competitive in most markets. This is a 2 barrel Motorcraft 2150 carburetor with an automatic choke. From core to finished product, this carburetor was rebuilt to factory pre-set internal and external settings. Ford Bronco 1977 5.0.